Is JSON a strict subset of Mark? Yes. Mark is carefully designed to have JSON as a strict subset. Any valid JSON source should be accepted as valid Mark input, except one circumstance you need to be aware of. Under Mark, property keys for both Mark and JSON objects must be unique under the same object. This is strictly enforced under Mark. But is left open in the initial JSON spec, and there are many implementations that accept duplicate keys in JSON. But the official JSON spec strongly advise against such practice. And there even are programmers utilize that loophole to put comment in JSON. If you follow such bad practice, then your JSON needs to be cleaned up first before migrating to Mark. But Mark has a clean data model that is a subset of JS data model. Security has been taken seriously when designing and implementing Mark. It is implemented to be as secure as possible. During parsing and serialization, Mark does not call any custom code. Objects and their constructors are constructed from scratch, not calling any custom code. Standard JSON.stringify() implementation calls toJSON() method if it is defined on the object, before stringifying the value. Such invocation might not be secure, and is not supported under Mark. JSON.parse() and JSON.stringify() also accept an optional parameter of a reviver and a replacer function. There are neither structured nor secure way to serialize and deserialize custom data types, thus no longer supported under Mark. Mark shall support serialize and deserialize custom data types under a separate project Mark Schema. Can Mark be used in languages other than JS? However, due to limited resource, the Mark handling library is currently only implemented in JS. But as Mark has a very simple syntax and data model, it should not be hard to port it to other languages. No. By itself, Mark is just a markup notation, thus not Turing complete. However, if some interpretation is applied to the content embodied in the Mark document, then it can be a very powerful Turing complete scripting language. Mark Template is such an example. Ant and XSLT are similar examples in XML. What is Mark’s road map? 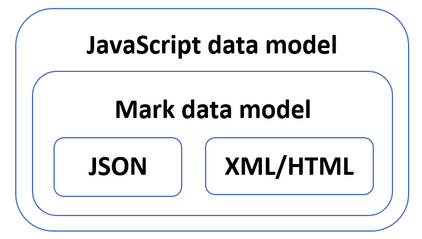 Like JSON, Mark’s syntax and data model is designed to be stable. I don’t foresee any changes in the near future. Thus the mark.js library shall remain stable as well. However, for Mark to be useful, a lot need to be developed on top of the basic Mark syntax and data model. And those activities shall happen in separate projects (like Mark Template, Mark Schema), without changing the Mark syntax and data model. Almost. The Mark syntax and data model has stabilized, and I don’t foresee any changes soon. The core Mark APIs have been thoroughly tested, and shall remain stable as well. mark.convert.js which provides conversion between XML/HTML and Mark, and mark.selector.js which provides query function on Mark data using CSS selector, are fully functional, and carefully tested as well. However, due to the complex nature of XML/HTML/CSS, there might be corner cases not properly supported. And they’ll be fixed through on-going maintenance. So you can start using mark.js in production environment already. For any critical data or usage, always test carefully and thoroughly before you cut over.